Political representatives across Friesland are calling for a national contingency plan for the Wadden Sea region in response to the MSC Zoe container spill. The ongoing clean-up and salvage operations in the Wadden region have been scaled up to emergency level four, and Leeuwarden mayor Ferd Crone will be coordinating the response. Dagblad van het Noorden reports that the mayors of the islands of Schiermonnikoog and Ameland, along with Frisian provincial representative Sander de Rouwe, have called on the PvdA in the Dutch parliament to implement a national contingency plan. While hundreds of volunteers have answered the call to come to the northern coastline and islands to help with the clean up, representatives for Friesland are growing frustrated by the lack of a coordinated response. Efforts have been made in The Hague to create an authoritative managing body for the region in recent months, but there is still no single central entity to coordinate the disaster response. As a result, the logistics of cleaning up the estimated 280 containers that fell overboard from the MSC Zoe have been extremely fragmented. Cleaning up the dikes is up to the water authorities, the sea floor is up to the Coast Guard and the Dutch Public Works & Water Management department, salt marches are in the care of the Dutch Forestry Commission or Frisian environmental protection agency It Fryske Gea, the Afsluitdijk belongs to the Water Management department and debris on shore falls under the purview of the mayors of the coastal and island municipalities. The Dutch Public Works & Water Management department has located 222 containers on the seabed in the North Sea, the majority of which are in a large debris field north of the Dutch Wadden islands. The Leeuwarder Courant reports that the department used two ships to survey the area over the weekend: Arca, a pollution control vessel, and Friendship, a salvage vessel. 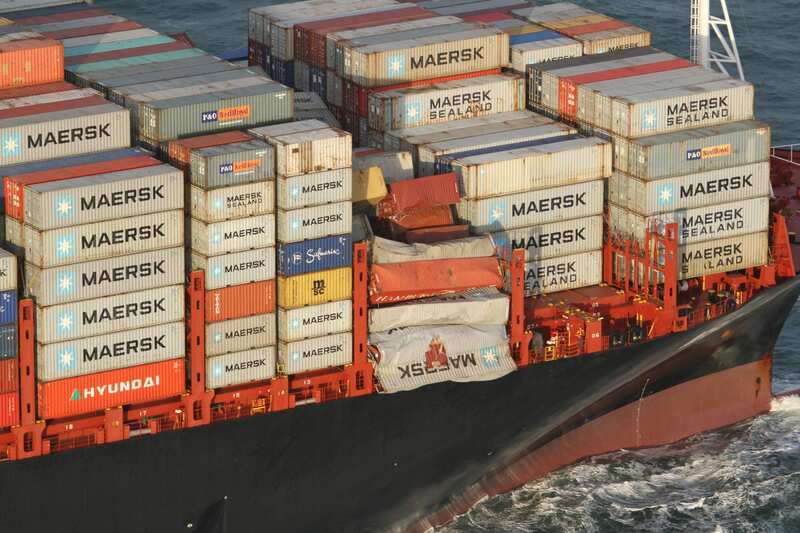 The total of 280 containers remains a rough estimate until a final inventory is completed on Bremen of the MSC Zoe. The possibility also exists that some of the containers found underwater over the weekend may have been there for longer, having fallen overboard from other ships. So far, 20 containers have washed ashore somewhere in the Wadden region, and the beaches and coastline across Groningen and Friesland have faced wave after wave of new debris for the past week. While the biggest items are relatively easy to clean up, pieces of microplastics and disintegrated sytrofoam are likely to be an issue in some areas for months or years to come, particularly in the marsh areas. The Wadden Sea coastline, which includes Friesland and Groningen, is part of Natura 2000, a network of protected areas in the European Union. The region was also designated as a UNESCO World Heritage Region in 2009. Much of the region is also designated for wildlife reserves and breeding grounds for birds.